A planet six times more massive than Jupiter has been spotted drifting, cold and alone, eighty light years from Earth. It's a sunless world, and astronomers say it could be the first real example of a free-floating planet to date. But how it got separated from its parent star in the first place remains a mystery. "We have never before seen an object free-floating in space that looks like this," said lead researcher Michael Liu, of the Institute for Astronomy at the University of Hawaii at Manao, in a statement. With no sun to call its own, the planet, which goes by PSO J318.5-22, joins the ranks of a cadre of similarly solitary entities to be discovered in recent years. But while previous free-floating, planet-like bodies (dubbed "planetary-mass objects," or "planemos" by those who would deny them full-on planetary status) have been notoriously difficult to distinguish from failed stars known as brown dwarfs, the astronomers who discovered PSO J318.5-22 say its identify is unambiguous. It's true Liu's team first noticed PSO J318.5-22 while searching for traces of failed stars in data amassed by Pan-STARRS1, a wide-field survey telescope situated atop Haleakala volcano, on the Hawaiian island of Maui. Like a brown dwarf, the object, which emits most of its energy at infrared wavelengths, showed up in readings as faint and red. What set PSO J318.5-22 apart was that it was very red – far redder, in fact, than even the reddest brown dwarfs on record. 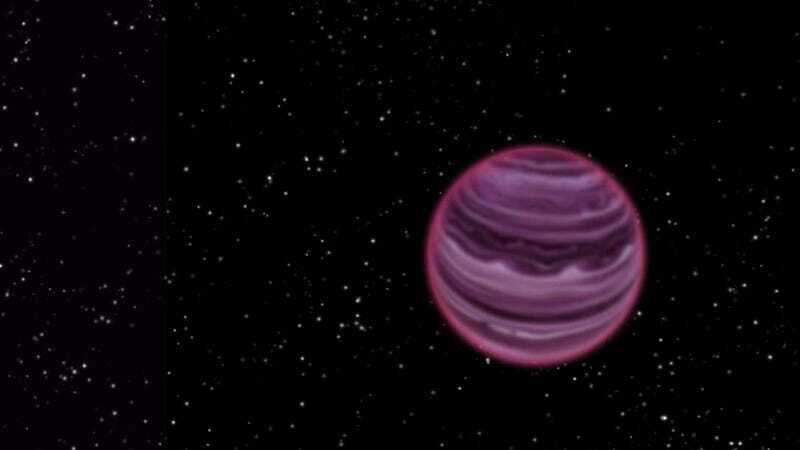 Followup observations led the researchers to conclude that PSO J318.5-22's infrared signature more closely resembled that of a newly formed planet than a brown dwarf's; while its low mass and relative youth (at an estimated 12-million-years-old, PSO J318.5-22's is most likely still in its salad days) resemble what astronomers typically expect from gas giants orbiting newly formed stars. "It has all the characteristics of young planets found around other stars, but is drifting out there all alone," said Liu. "I had often wondered if such solitary objects exist, and now we know they do." But what of its parent star? According to the researchers, there are at least two good reasons to believe PSO J318.5-22 belongs to a collection of young stars called the Beta Pictoris moving group. One: Like PSO J318.5-22, the Beta Pictoris moving group is thought to have formed around 12-million years ago. Two: Beta Pictoris, the star from which the group takes its name, is known to harbor a young gas-giant planet of its own – one that is roughly eight-times as massive as Jupiter. Whether PSO J318.5-22 was flung from the Beta Pictoris moving group or formed independently from it by some still-unknown process remains unknown. Be that as it may, Liu and his colleagues believe the planet presents a rare opportunity to do some science far from the blinding light of a nearby star. What causes rogue planets to run away from their stars? "Planets found by direct imaging are incredibly hard to study, since they are right next to their much brighter host stars," said Niall Deacon, a postdoctoral fellow in Liu's research group, and co-author on the paper. "PSO J318.5-22 is not orbiting a star so it will be much easier for us to study. It is going to provide a wonderful view into the inner workings of gas-giant planets like Jupiter shortly after their birth." The researchers' findings are to be published in a forthcoming issue of Astrophysical Journal Letters. They can be accessed, free of charge, at arXiv.